I’m a feminist but… I haven’t got a woman to write this review. However, blokes needn’t be banished from the brand of guilty feminism that has proved so successful for Deborah Frances-White through her hit podcast, just as long as they are allies to the cause. In fact, she acknowledges that the patriarchy does a disservice to many men, too, fostering a damaging toxic masculinity. That’s how careful she is to make sure everyone’s included. She’s especially keen to check her privilege at every turn, aware that there are plenty of social systems that give middle-class white women like herself a boost that’s denied to many of her sisters and ensuring that’s not overlooked. ‘Intersectionality’ isn’t the prettiest word, but it’s clear from this spin-off book from her hit podcast, that its ethos is important to the comic. Occasionally this book gets a little preoccupied with the dry theory of such things, such as in the opening stages when it charts each numbered wave of feminism. But mostly Frances-White knows that actions speak louder than treatise, and this sincere and readable tome is packed with real-life examples to inspire. Indeed, the premise of her Guilty Feminist brand is that the drive for equality does not require unquestioning adherence to a set of strictures laid down from on high. For why replace one rigid hierarchy with another? Frances-White’s own guilty pleasures include Dirty Dancing, the reality show Say Yes To The Dress and Pretty Woman. She argues the first two are feminist enough, and Julia Robert’s Pygmalion story might be, but is still problematical. Fun as such debates are, Frances-White is keen to make this book a guide that’s practical and rousing; a call to encourage women to take steps towards the future they want and offering hope that it can be achieved. Her own background proves that things can change. As she’s discussed in her stand-up, she used to be a Jehovah’s Witness. And breaking out of that highly regimented sect, where women where institutionally ignored even more firmly than in wider society, has given her both a practical toolkit for changing things, and a belief that ingrained structures can be overturned. So much of the Guilty Feminist book is about suggesting ways in which women can make incremental differences, not to be overwhelmed by the size of the task. She talks of her own podcast as a ‘microclimate for women to shine’ and has seen first-hand how positive effects snowball. In her spirit of collaboration, the book is not only defined by her ideas, as there are interviews with the likes of comedian Zoe Coombs Marr, actor Susan Wokoma, disability rights activist Becca Bunce and an essay from Hannah Gadsby on why the marriage equality plebiscite in Australia prised open wounds, not healed them. Inspiration comes from historic figures, such as the pioneering (and fascinating) 17th Century poet Aemilia Lanyer, and more modern ones like Michelle Obama. Not to mention rewriting the ‘once more unto the breach’ speech from Henry V, which would stir anyone into action. Though the book is a state-of-the-movement overview of the complexities of feminism, Francis-White offers up some different perspectives, too. For example, while consent is rightly a red-button issue she wants to reframe the whole language. That’s typical of the thoughtful, heartfelt writing. The book is not very often funny, in case you were expecting that from a comedian. But rather she’s deployed her stand-up skills to communicate directly and efficiently – at least mostly. 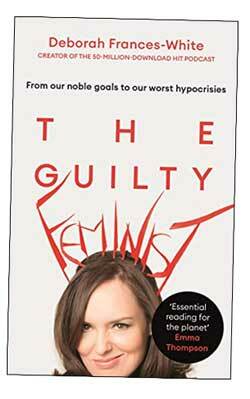 The Guilty Feminist by Deborah Frances-White is published by Virago priced £14.99. Click here to order from Amazon, priced £10.49.